Performance parts, equipment & accessories offered by Taurus. Including a large selection of original catalogues. A collection of original correspondence from taurus. 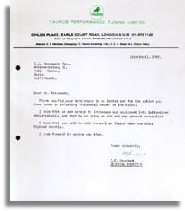 Literature related to the performance kits offered by Taurus. A collection of contemporary reviews of taurus products & services. 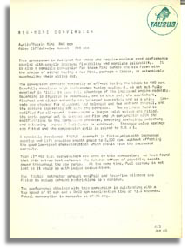 Click on the image to the left for the full archive. A long lasting & influential tuner, that just faded away. Another one of the very best known 60's tuning firms. 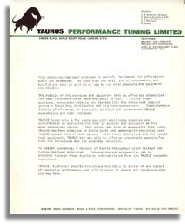 Throughout the 60's TAURUS were another of the tuning firms who realised the value of both Advertising and even more importantly Competition success. Their tuning developments were firmly based in practical competition experience. 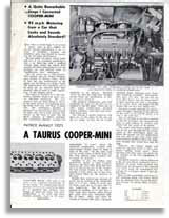 Sadly, almost totally forgotten now, Taurus were one of the genuine prime movers in early Mini Tuning, starting out from small mews premises in Earl's Court (London) it soon grew to offer all the alternatives you would expect including new cars, converted cars and a huge range of high quality accessories under their own name. They even did engine work for the likes of Radford & Hooper. Although relying on 3rd party supply for a lot of their day to day accessories they did introduce a lot of interesting products of their own. 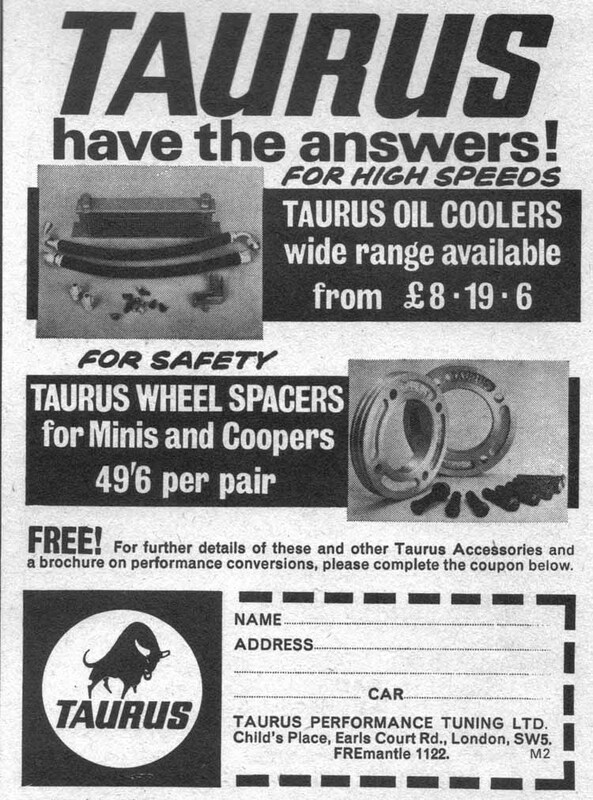 Probably the most interesting being the "Taurus Oil Stat" they were the first company to offer a small oil thermostat suitable for road cars. Details of which can be found further down this page. I hope you enjoy this section because, in 2006 all Mini fans have heard of the likes of Downton & Speedwell, where as the 3rd company of the "Big 3" seems to have gone forever! 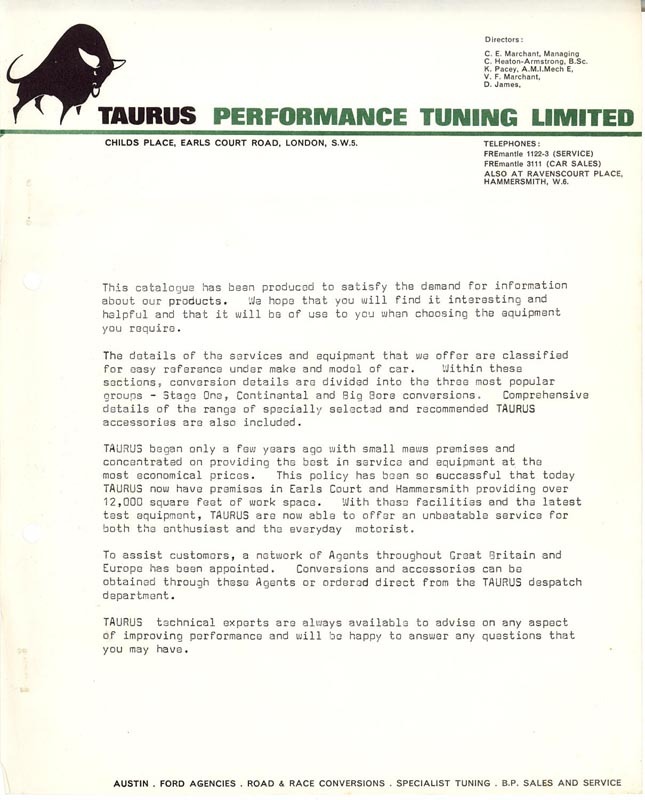 I have recently been contacted by former Taurus employee Richard Gwynne-Evans who has been kind enough to write down a few of his memories of working for Taurus during their hey day. I am very grateful to Richard for taking the time to share these memories.